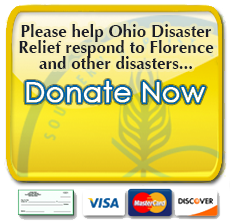 The SCBO Disaster Relief Ministry responds to disasters and needs in Ohio, across North America, and around the world. This ministry first came to Ohio in January, 1986 with the establishment of the Food Service Unit. It has since grown to include many more ministries which you can read about below. Our teams are made up of specifically trained volunteers who give of their time and talents to serve Christ in a crisis. Resource funding for this volunteer-based ministry comes primarily from Southern Baptist churches through the Cooperative Mission Program, the Ray Roberts State Mission Offering, and donations from compassionate individuals and organizations who desire to help people in need. Volunteers cut downed trees from homes and buildings and stack logs in a location designated by the property owner. Also, pull brush and stack accordingly. This usually occurs following tornadoes, ice storms and even hurricanes. Safety is of utmost and all volunteers will wear the safety attire and use the saw equipment provided. Volunteers must be members of a Southern Baptist Church in Ohio and 18 years of age. We currently have over 300 volunteers trained in this ministry, and there is still room for more! Our chaplains are trained to minister to the disaster victims as well as minister to our Disaster Reliev volunteers by providing a listening ear and sharing comfort. Training is offered once a year and takes about a full year to complete all activities required to be endorsed by the North American Mission Board. A person cannot serve as a chaplain unless they are endorsed by NAMB. Additional training required includes at least one of the disaster units and completing Operational Stress First Aid (OSFA), which is offered along with the Chaplaincy Training course. Individuals also are required to make application with the North American Mission Board (NAMB), complete all requirements for Endorsement. After you receive your endorsement from the Chaplaincy Commission, you would be permitted to serve as a Chaplain. Volunteers care for children ages birth to 2nd grade while parents recover from the disaster by working with the relief agencies, insurance, FEMA and sometimes even going to work. We have the equipment separated into age groups for ease in use. Duties include unloading and loading equipment from the trailer into a safe and secure building location, sanitize location, sanitize toys after use, provide loving care for the children and sympathy for the parents. Prepare meals for children and team volunteers. The Communications Team is responsible for establishing and maintaining wireless radio communications between aid workers and agencies. Following a disaster traditional communication methods such as telephone, TV, and internet are often unavailable for days or even weeks. This makes the communications teams invaluable additions to any disaster response. Volunteers prepare hot meals using a field kitchen to line feed (much like cafeteria style feeding in an open parking lot or field), prepare containers for use in Red Cross or Salvation Army vehicles for serving, inventory food, clean up area, wash cooking utensils and pots, move full cases of food from storage to the kitchen for use, unload truck and load truck, set up field kitchen and take down field kitchen. The day usually begins around 5 a.m. and ends around 6 p.m. Normally, we prepare lunch and supper each day, with lunch being ready to serve at 10 a.m. and supper ready around 3 p.m. The clean up at the end of the day requires 2 - 3 hours of team effort. This area of the Disaster Relief Ministry removes furniture, carpet, appliances, etc. damaged in a house as a result of flooding. Basically gutting the house and preparing for rebuild. The volunteer will be provided protective gear, including covering, gloves, and often a mask to prevent breathing in toxic air. Tools are provided on a specially equipped trailer. Items removed will be taken to a designated area away from the home, usually to the edge of a road where trash collectors come by and pick it up for hauling to the dump. This area of ministry volunteers maintain the shower trailer unit in working condition, clean showers after use, launder towels and wash clothes, and also launder volunteer clothing as needed. A normal day consists of cleaning the unit thoroughly and doing laundry during the day while volunteers are out in the community ministering to the disaster victims. Then, in the evening, the staff will account for users via a standard log and provide necessary shower items (soap, towel, wash cloth, shampoo), and wipe down the shower after each use. Users of the unit are normally our Disaster Relief Volunteers. There may be occasion for disaster victims to also utilize these facilities, however this is out of the norm.